I think that we are all familiar with the epic duel between David and the “giant” Goliath from the first book of Samuel. Twice a day for forty days, Goliath, the giant champion of the Philistines, comes out and challenges the Israelites to send a champion of their own to decide the outcome of their conflict in single combat. The Israelites are afraid of him, but the boy David steps up to the challenge. Armed only with his staff, a sling, and 5 stones, David faces Goliath and his armor and sword and shield. He strikes Goliath in the head with the first stone from his sling, and the Philistine falls on his face. David takes Goliathâ€™s sword and decapitates Goliath. While this story is an example of faith and trust in God, it has also become the rally cry of the entrepreneur. One person CAN compete. 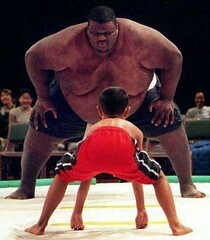 An individual can stand up to the big man and over come the odds to win. In this story we see that there was only one person in the whole army that was willing to take a chance, but those numbers are changing. With today’s technology an individual can set up a business and be a success. As I am working to understand more about this changing market and my place in it, I’ve found a prime example of this principle on the internet. With the popularization of web and mobile applications, there is a rush to cash in on the next big iPhone app. The iTunes store seems to have its favorites, its Goliaths, that gain in popularity as they are pushed to the front lines, but where are the Davids? How does a little guy compete with that ocean swell? That Gigantic corporate structure with it’s herd of fans doesn’t know me or what I might want but my friend Blake has an idea. Blake is David. He’s the guy with the idea. He recognizes that there is a vast ocean of opinions about these different applications so he’s made a way to turn to and trust his friend’s opinions called Appteria. By tying into his social network on Facebook, and inviting his friends to join together with their social networks, he has made a way to get a more trusted recommendation on new applications. Check out the site and find some great new programs. It’s such a great idea that Apple decided to make their own fan page on Facebook. Goliath is not as tall as we once thought, and the stones in my sling just got better. Thanks, Spencer. After a weekend of looking at the Goliaths, I decided there is definitely space for Appteria. There are lots of updates coming soon. Next story Check out that Fancy Stamp!